Happy Hannukah for those celebrating that holiday. And Happy Birthday to my sister who doesn't read my blog, but I have to say it anyway (27 today! wow). I hope this is a relaxing week for everyone, but the bad weather in the US and people travelling during the holidays to family get-togethers (not to mention the shopping) can be stressful. Calming thoughts your way. I know I already booked the wrong flight to Phoenix for my sister but at least it goes to the right place, just at the wrong time. What airline has a flight 4431 and 4413 leaving one hour from each other from the same airport to the same destination? Oh well, it isn't a huge gaffe so we're not changing the ticket. I'm really looking forward to seeing the family. Eventually they drive me crazy but I still like them. I have a couple of reviews I have to post that are coming later (Nick and Norah's Infinite Playlist by Racheal Cohen and David Levithan and Ariel by Steven Boyett). These will be coming when I feel less lazy. Dear Author posted last week that they just partnered up with Sony so that the Dear Author reviewers could get a Sony eReader to use to review ebooks. 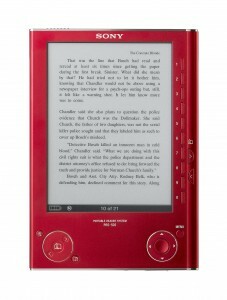 They say that in early January there will be a contest so that 3 Dear Author readers can have a chance to win their very own Sony eReader in Sangria Red too. Man, I would love to win one. I know someone who owns one, and they are really pretty and come in a protective cover that flips open like a book. Words look crisp and they use e-ink technology. The problem is, the cost is almost 300 dollars, and I know how many books I can get with 300 dollars. If I could justify that eventually I could save that money through using an ereader I would get one, but I have a hard time with that. Plus I'm one of those people – I will stare and stare and think about it and decide maybe 6 months later to buy something like this. It took me a year to buy my digital camera. Also I am a bit worried about running into problems if it breaks, do I lose all my books? That sort of thing that I wouldn't worry about with a real book, but then I realized you can download books to your computer and then put that into the ereader, so I guess the computer can be the backup. I am still unsure about this though. How about a double backup? About once a year my laptop crashes, so let's say I've had experience with losing data and I know that backups are very important. The other thing is that you can only import books to the reader that have the DRM from the Sony ebook store. What happens to other books I got on my computer I bought elsewhere and may want to put on my reader? That worries me. If I bought something I want to be able to read it where I want. Another thing I don't have to think about with a real book. Anyone have an eReader? Do you like it? What are it's advantages and disadvantages? Meanwhile - I noticed this at the Sony eBookstore. Looks like the free book changes weekly. 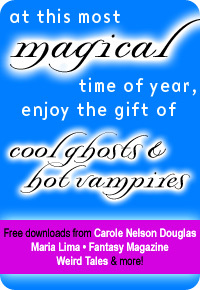 Right now they're offering Dancing with Werewolves by Carole Nelson Douglas till the end of day today. You have to download the Sony eBook Library Software to read it though. That didn't take me long. This entry was posted in Uncategorized and tagged ereader, freebies by janicu. Bookmark the permalink.